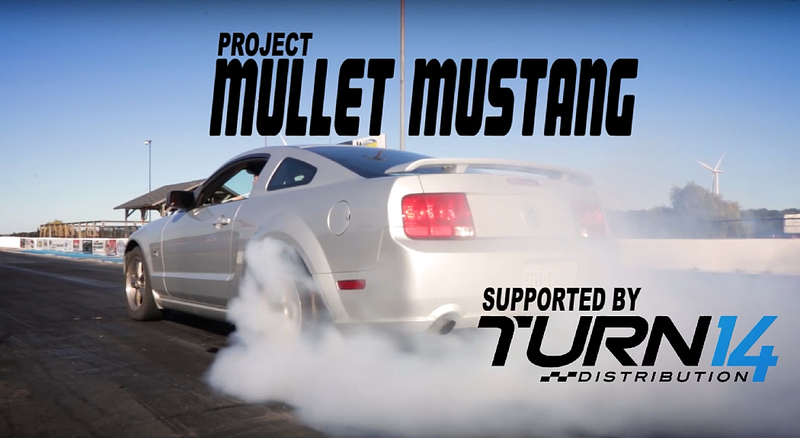 Last week we posted the first of our S197 Ford Mustang GT videos to our YouTube channel, introducing the Mullet Mustang to the world (if you’re wondering about the name, check out the video below and it’ll quickly become obvious). 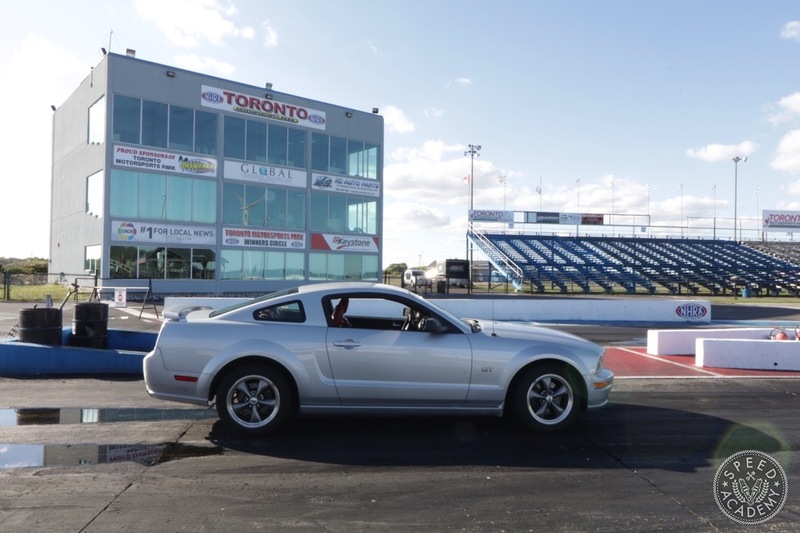 Supported by our title sponsor, Turn14 Distribution, our goals with the Mustang are threefold: 1) get into the 12-second bracket on the drag strip, 2) go sub 1-minute 20-seconds on our local road course at Toronto Motorsports Park, and 3) do some big, smoky powerslides (or what you young whippersnappers call drifting) once we’ve achieved 1 & 2. 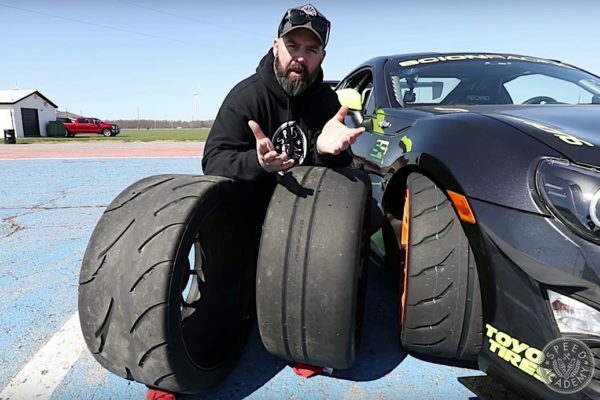 So I guess you could say our overall goal is to show people how much fun you can have with this affordable hunk of Detroit iron, turning what some people might consider a less that optimal suspension design into a true triple threat (drag, time attack, and drift). 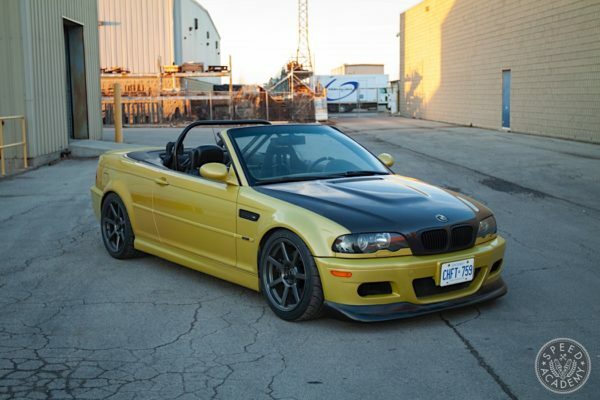 We also want to give it a bit of JDM flare, since that’s kind of our style. 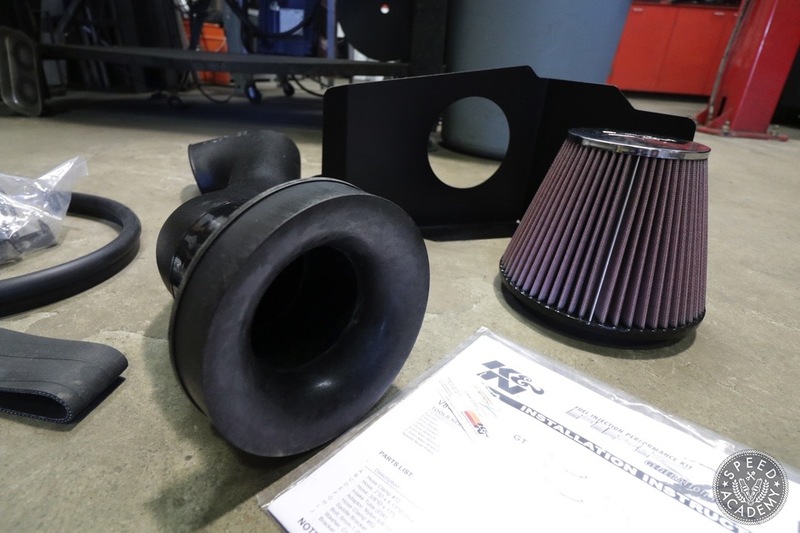 And since this project is being supported by Turn14, we’ll be using as many parts as possible from their line card, which shouldn’t be difficult since they’re wholesale distributors for a huge number of the best high-performance brands on the market today. Like any self-respecting Mustang owner, we decided to start the build by adding power. 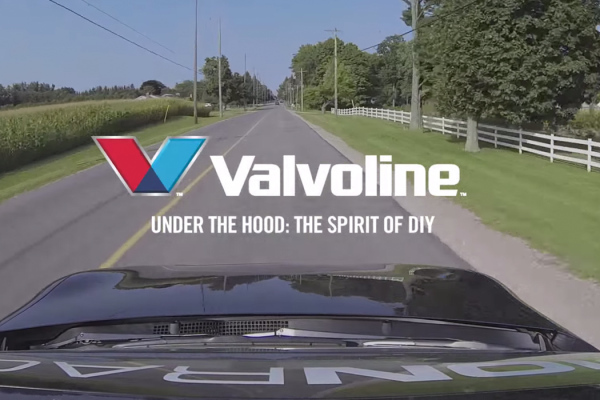 You know, because more power is exactly what a 250,000 km Mustang on bald all-season tires and a worn out suspension needs, right? 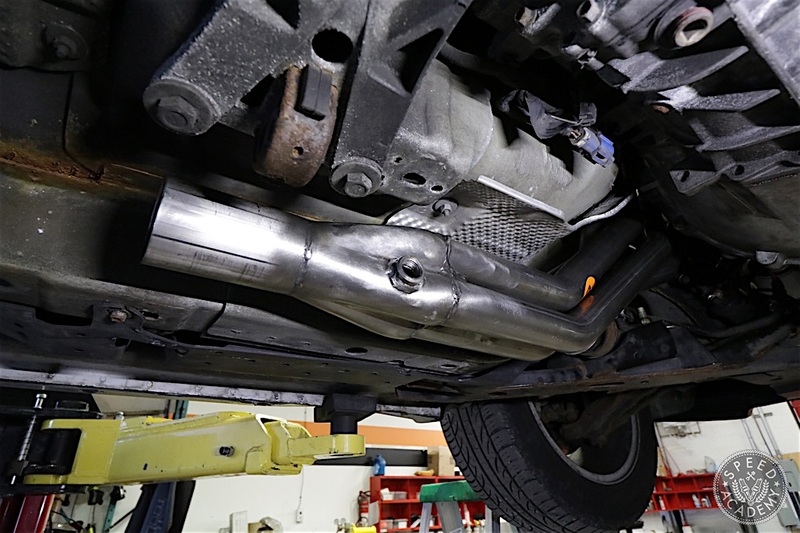 Having done some homework online, we decided to go with Borla long tube headers and x-pipe (which deletes the cats), Borla axle-back Touring mufflers, along with a K&N high-flow intake system. We also ordered an SCT X4 Performance Programmer so we could dial in the ECU for this set of mods and future power upgrades, but more on that in a future story. Rather than attempting this job on our backs at our little tuning dungeon, we invaded NV Auto in Hamilton, Ontario so that we could use one of their 2-post lifts and assorting of pro tools. 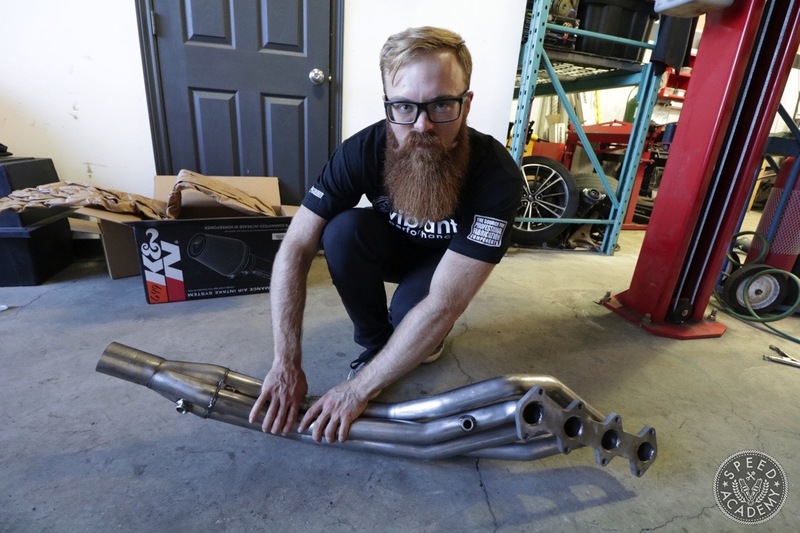 Installing long tube headers without a lift is just not a fun job at all, and we’re doubly glad we imposed on our friends at NV because Dov, Nam and their in-house pro drifter Riley Sexsmith (above) all pitched in when we needed a hand and two. Removing the OE headers and catted cross-over pipe wasn’t too bad, but we got pretty luck on the header studs since the nuts were all pretty rusty. With heat and the right tools, we did get them all out without breaking a stud, though. Bolting up the stainless steel Borla long tubes wasn’t as bad as some other long tube installs we’ve done, but we did have to disconnect the steering column, remove the driver’s side engine mount and loosen the steering rack to gain easy access to the head bolts on that side of the engine. We made sure to mark the position of the steering column so that we could hook it back up in the correct (centered) position. 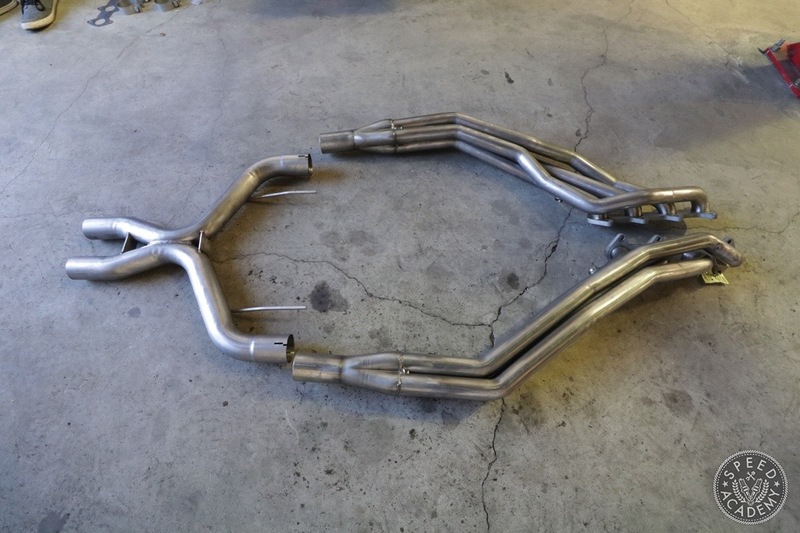 These headers were originally designed for the Miller Mustang Cup, a spec series racing S197 Mustang GT’s that was based at Miller Motorsports Park in Utah. These are proven power makers on the 4.6-liter V8, featuring 1.75″ diameter primary tubes and a 2.5″ diameter merge collector. 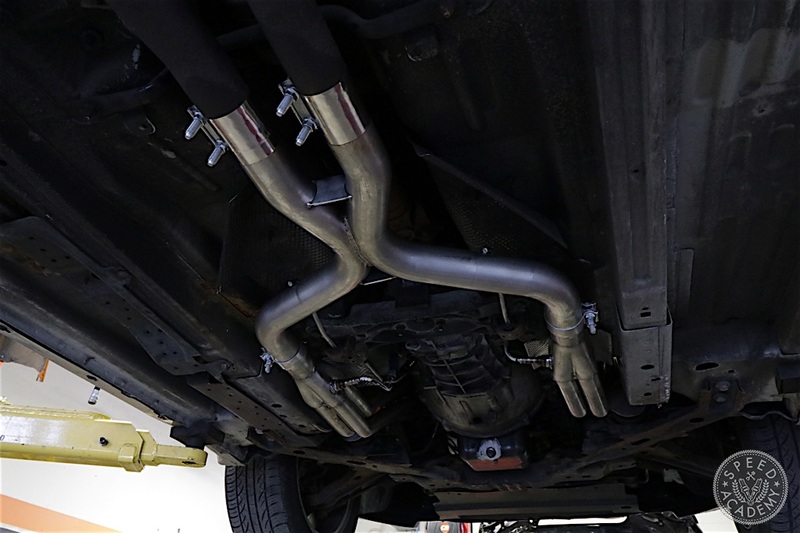 It’s also worth mentioning that these headers are intended for off-road/racing use only since they delete the catalytic converters, but we will add in two high-flow cats at a later date to ensure the Mullet remains fully street legal. 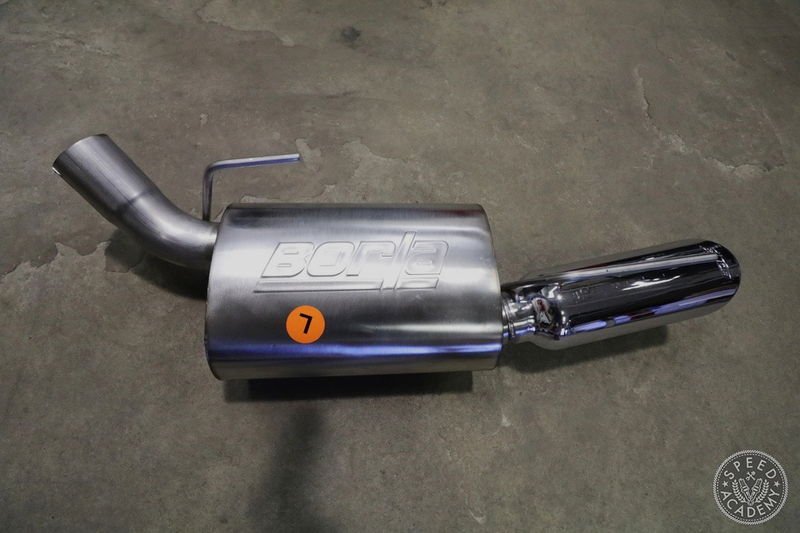 We were very impressed that Borla includes these Stage 8 fasteners with their long tube headers. 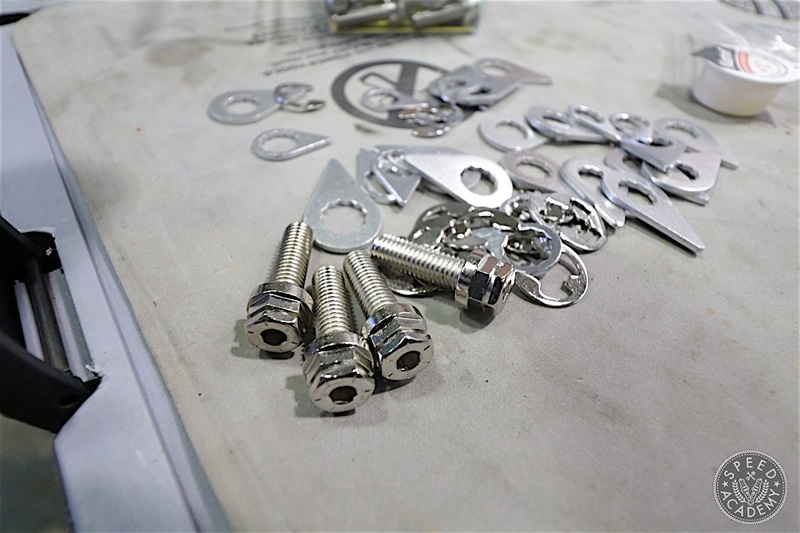 The bolts are nickel plated, aircraft quality Grade 8 413o alloy steel, and the lock washers and the ice cream cone shaped clips are designed to prevent the bolts from backing out by pushing the pointy end of the cone against the primary tubes. 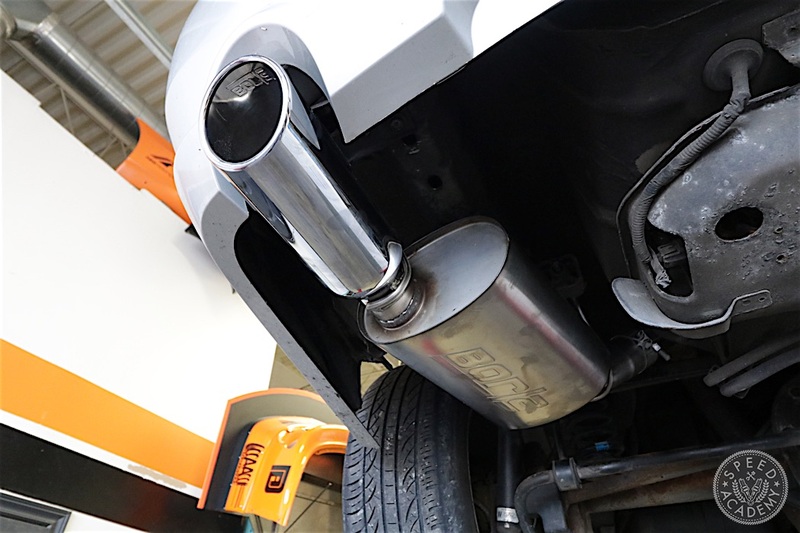 It’s quite an ingenious design and should ensure we’ll never have an exhaust leak at the heads. 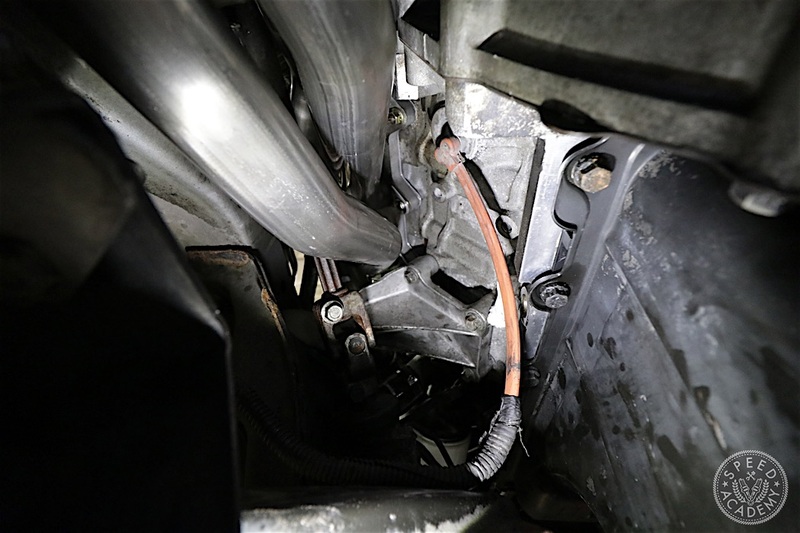 With the long tubes in place, we bolted up the dual 2.5” stainless steel x-pipe, which fastens to the OE rear axle over-pipes. 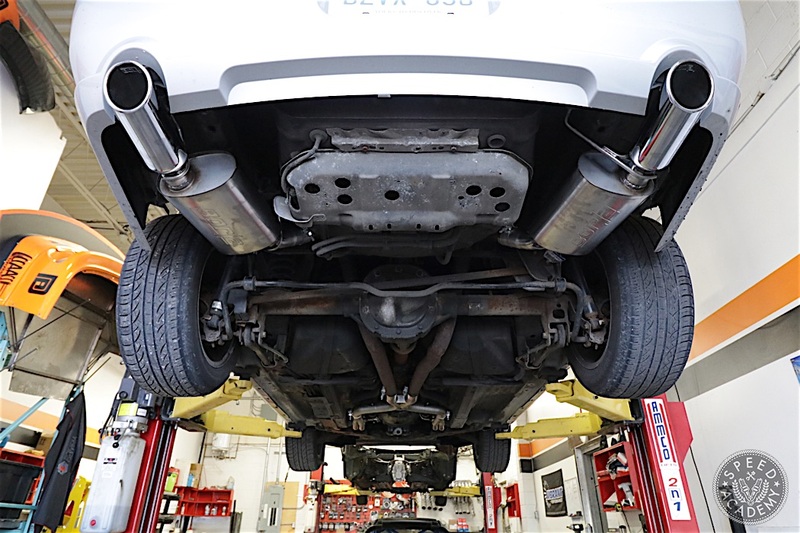 Finishing our exhaust setup are these Borla Touring muffler sections, which again are full stainless construction and do a remarkably good job of limiting exhaust dB. 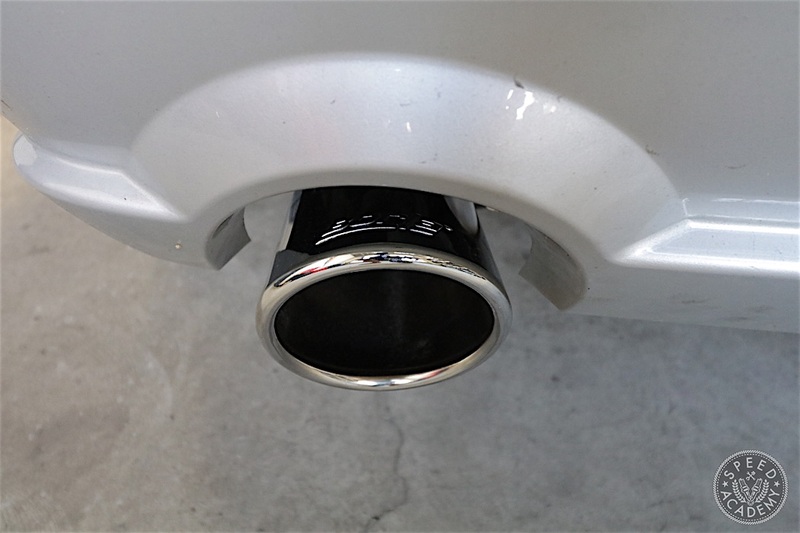 We thought for the sure the Stang would be extremely loud with long tubes and no cats, but to our surprise, the Touring mufflers completely eliminate any drone while cruising, so much so that the car might be quieter than stock at light throttle positions. But when you stomp on the gas you do get a nice growl, and that growl is growing in ferocity now that we’ve put some miles on the system. The tips also have a nice subtle appearance to them that should keep the Mullet flying well under the radar. 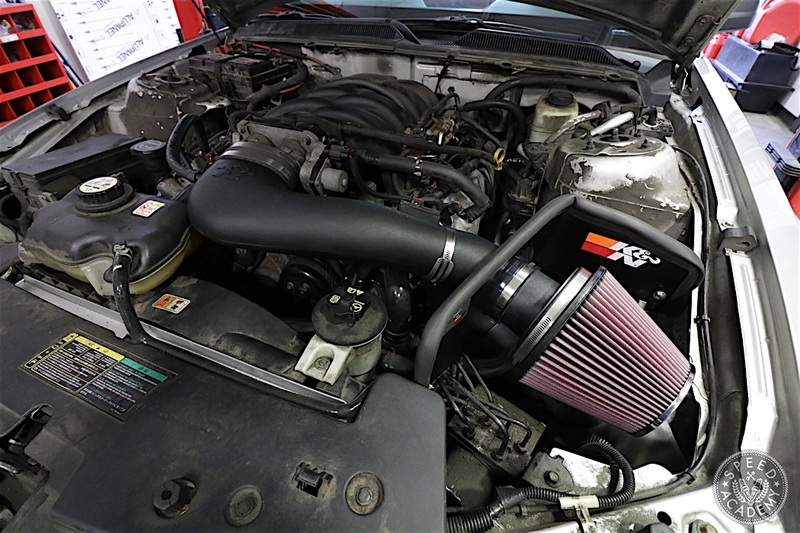 On the induction side, this K&N FIPK intake system also adds some sweet induction noise to the mix, though much like the Borla parts, we were pleasantly surprised by how civilized the engine note is while cruising. The free-flowing high-density polyethylene tube also has a stealthy OE look to it that we really like and its smooth radius bends surely contribute to the power it frees up. 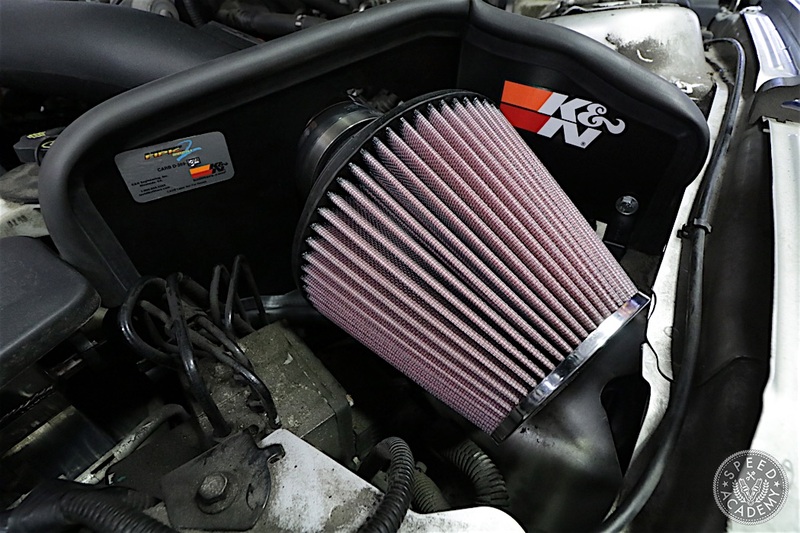 As you’d expect, this system breathes in through one of K&N’s washable and million mile air filters, and as that sticker on the heat shield to the left of the filter indicates, it’s a 50-state legal system, meaning it is legal for road use in the United States and should be legal here in Ontario too since it uses the factory MAF sensor and crank case breather system and therefore won’t set off a Check Engine light. 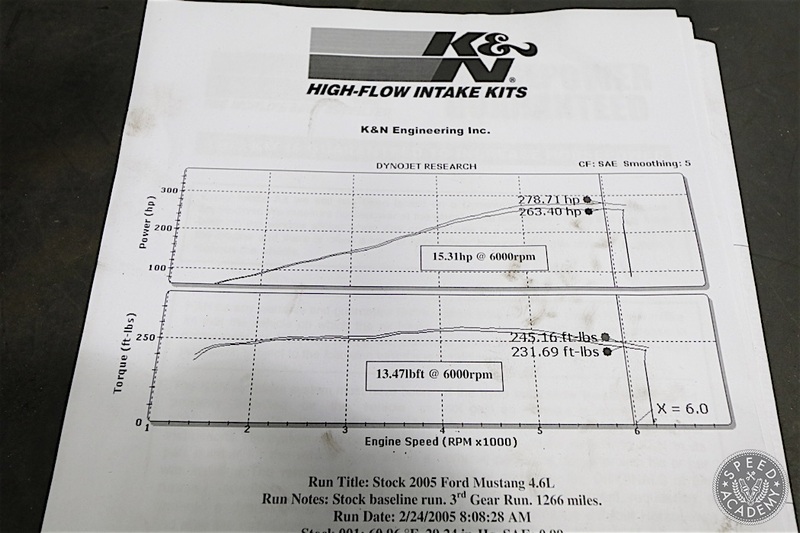 In typical K&N fashion, the kit fits perfectly and includes all the required hardware, detailed installation instructions, and even a dyno graph reporting an expected 15-whp gain and almost as much torque. 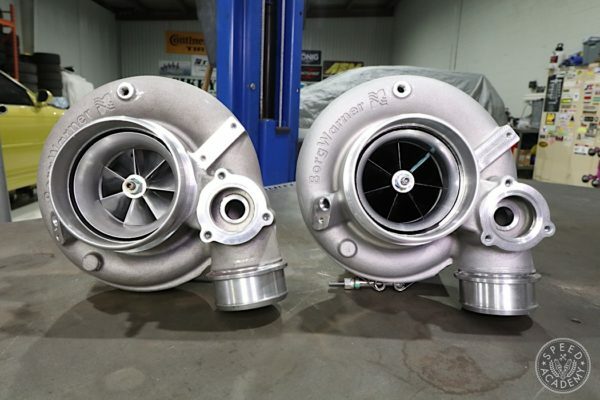 We expect this set of power upgrades should net us about 30-whp on the dyno, and once we get Sasha from OnPoint Dyno to tune the ECU with the SCT unit we hope to be up into the 290-300-whp range. 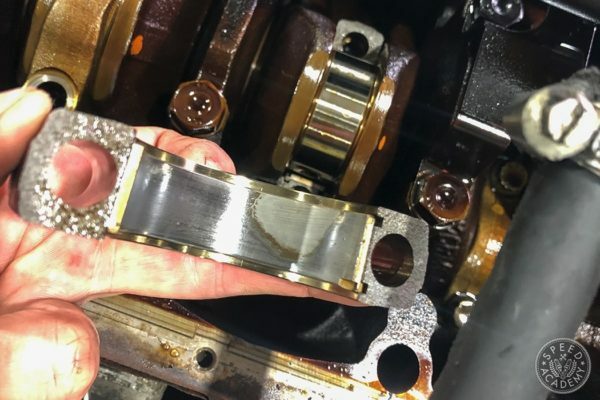 After that, we’ll either stay with some more all-motor mods like cams and head work or maybe we’ll throw some boost at it. Or perhaps we’ll even do a little from Column A and a little from Column B. Time will tell! 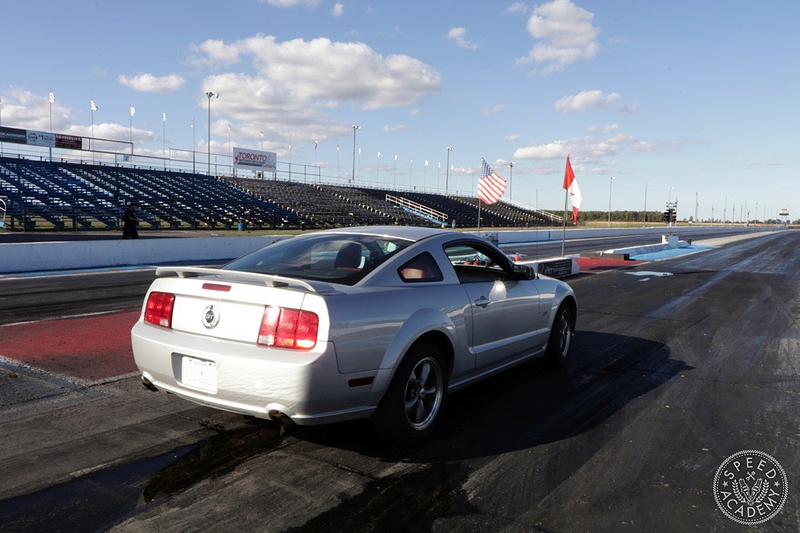 Next, we’re going to tackle the first round of suspension upgrades, with a track test to follow. Stay tuned, because we’ll have regular Mullet Mustang updates coming at you over the next few months. We’re calling it Mustang Mondays over on our YouTube channel since there will be a new episode in the series every Monday until the first part of the build is complete.